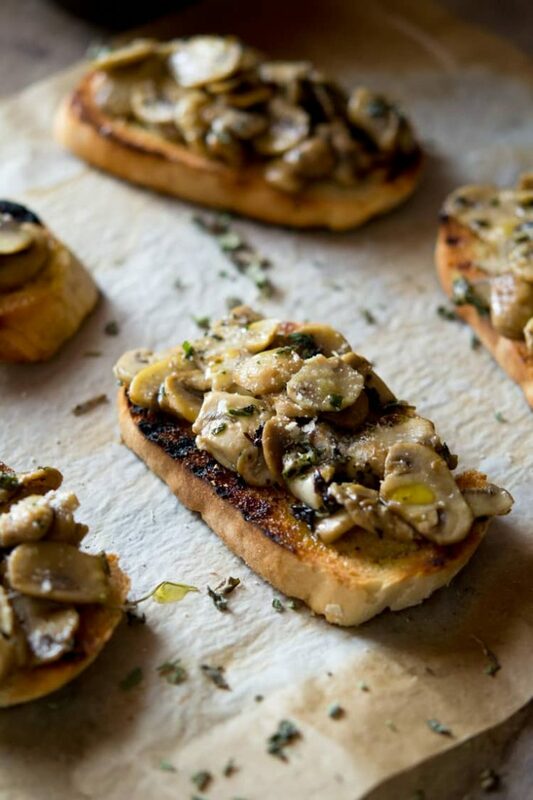 Delicious oregano mushrooms mixed with parmesan and extra virgin olive oil and served on crusty garlic toasts. This parmesan mushroom crostini makes a great, easy and tasty appetizer or snack. Crostini is so easy to make and is one of my all time favourite appetizers. My favourite crostini toppings so far are pecorino, prosciutto and truffle honey, sausage and stracchino and this parmesan mushroom crostini. It’s been a long hot summer in Italy and I am so ready for Autumn/Fall. Leaves are already turning colour and falling from the trees, it could also be because they are so damn dry but I can only hope it’s the first signs of fall. Anyway, I’ve been thinking of all the delicious fall food that I can’t wait to start cooking and this mushroom crostini is one of them! Mushrooms just scream fall to me and it won’t be long before I see my neighbours arriving home with baskets full of them. 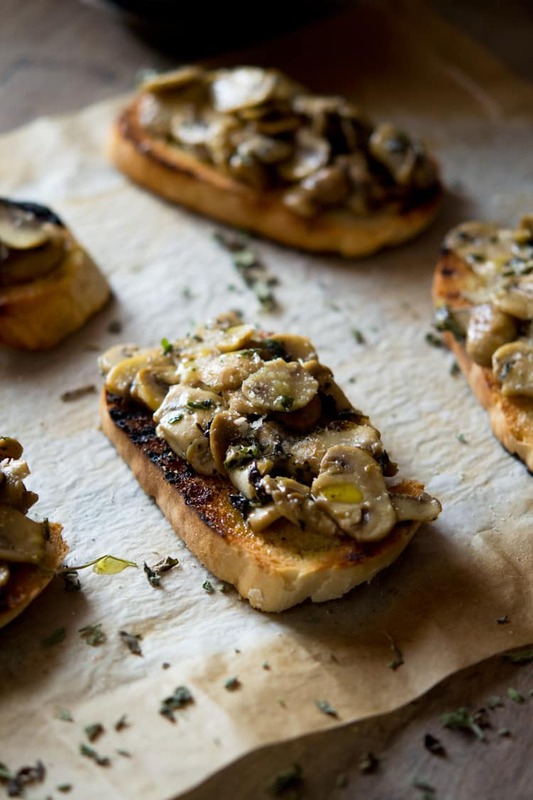 This parmesan mushroom crostini is very simple yet is packed full of flavour. I first toast some crusty bread on a hot griddle pan. Rub the bread slices with olive oil then toast them on each side until there are some charred grill marks on each side. Whilst they are still hot rub a garlic clove over one side of the toast all the way to the edges. For the mushrooms, simply finely slice them then fry them in a little olive oil with 2 tsp of oregano. Add a good pinch of salt and pepper, I always taste the mushrooms a couple times whilst adding the salt because they always need a little more seasoning than you think. Once cooked spoon the mushrooms into a bowl and add 1 tbsp of grated parmesan. Stir then top the garlic toasts with the mushroom mixture. Serve. What’s your favourite Autumn/Fall foods? I hope you enjoyed today’s recipe and don’t forget to pop over to my blog Inside The Rustic Kitchen to say hi! 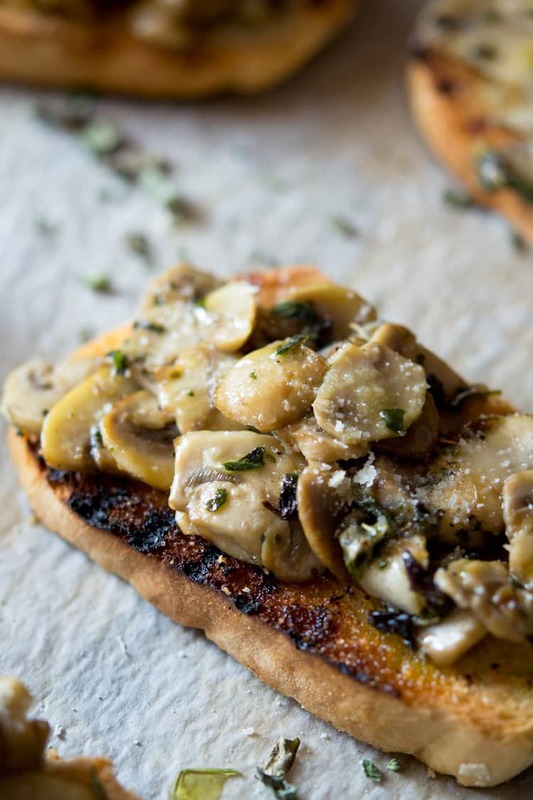 Delicious oregano mushrooms mixed with parmesan and extra virgin olive oil and served on crusty garlic toasts. Mushroom crostini makes a great, easy and tasty appetizer or snack. Drizzle each side of bread with olive oil and toast on a hot griddle until toasted and charred on both sides. Whilst still hot rub the top side of each slice with the clove of garlic making sure to cover all the way to the edges. Clean any dirt on the mushrooms with a damp paper towel and finely slice. Add 1 tbsp of olive oil to a large frying pan and add the mushrooms. When the mushrooms start to release water and wilt down, add the oregano and a good pinch of salt and pepper. Continue to fry the mushrooms until cooked through (about 5-10 minutes). Spoon the mushrooms into a bowl and add the grated parmesan, stir to combine. Top the garlic toasts with the mushroom mixture and serve.